This is a fantastic idea to add wireless capability to hi-fi system. Who doesn’t want the freedom from cables. The famous British high-end audio manufacturer Arcam has just launched a new Bluetooth adaptor rBlink with apt-x codec supporting for Hi-Fi units. rBlink is a true hifi product for connecting any smart device as a music source to your audio system via a combined digital PDIF/coaxial output or the RCA output. This is something can convince those audiophiles that Bluetooth is now able to deliver best possible sound worthy of their ears. The first sight of Arcam rBlink, the huge antenna draws most of my attention. Streaming range is usually the shortcoming of bluetooth device. This big antenna gives me some confidence. Generally speaking an external antenna is a guarantee of stable connection and less drop-outs. You cannot find this design for those Bluetooth music receivers below $100. The following tests confirmed this opinion. Arcam rBlink is included in a heavy cast brushed aluminium case with a thick rubber base. That is made with a soft-touch material which can keep the receiver from moving and prevent scratching of other HiFi components. In terms of size, the rBlink is 8.0 x 10 x 2.6cm. It can survive pretty much anything with a weight of 350 gram. The design of rBlink’s interfaces seems a little odd. You can see an antenna reside, a pairing button and a power input on the back, which are in the normal places for them. But all the outputs including the combined optical and coaxial outputs and one standard RCA output are located on the front. That is something different, but not abrupt. It has the digital interface for new receivers and also the analog RCA output, invented in the 1940s, for any audio system. As a hifi product Arcam rBlink has a costly TI Burr-Brown PCM5102 DAC chip on mainboard like Mass Fidelity Relay does. Contributing to this PCM5102, the THD (Total Harmonic Distortion Noise) of rBlink receiver is just 0.002%. rBlink has apt-X, which is an improved profile for sending audio signal over Bluetooth. You can see from the table below, apt-X has the highest transmit bit rates before lossless files. The audio quality it offers is near CD-quality. This tech first appeared on Apple devices. Android phones and tablets recently released have this feature. Nonetheless, most iOS smart devices aren’t apt-X supporting. Just keep in mind; you won’t get the very best sound quality of this Bluetooth music receiver without apt-X supporting from the source device. 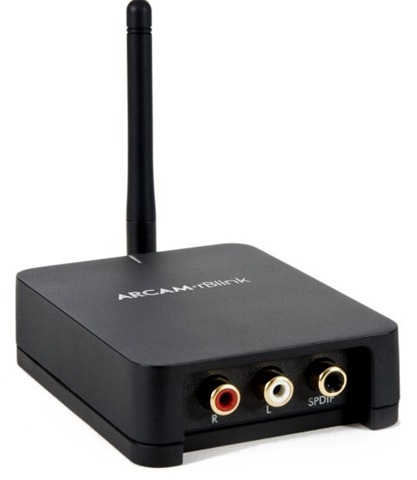 The Arcam rBlink works well with apt-X Bluetooth devices such as MacBook or Sony Xperia Z. It provides us a well balanced sound with extreme details, big scale and deep bass. Sense of space and positional feeling are so clear, so it doesn’t sound like Bluetooth at all. For help with the large antenna, there are no audio drop-outs when playing different music in a preset position or wondering around. It offers a new way to enjoy wireless music in an excellent imaginable quality. Of course, without Apt-x you wouldn’t have quite the same level of detail or dynamics. The biggest compliment we have for the rBlink is this little gadget lacks a bit of subtlety and details on high compared with a wired connection. All in all, it provides extremely good quality which I never experienced with a wireless connection. It should end the discussion about the distortion of Bluetooth audio and combat jitter. No other problem! Brilliant little device! rBlink may be a neat and well-made little unit. Its outstanding quality of sound, digital output support, apt-x codec and costly DAC chip are totally superior to other generic Bluetooth music device. 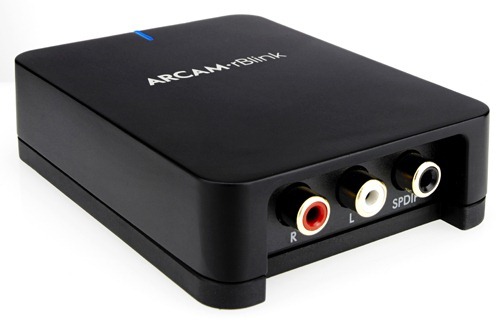 There are other reasonable features for you to have this Arcam rBlink Bluetooth DAC adapter over a cheaper one. The external antenna must be one of them. You cannot expect more from this tiny device. The problem for us is the cost- $249- relatively pricey. However, the cost is pretty affordable for audio lovers who care more about what improvement they can get from this adapter not the money to get it. If you have one or two aptX sources and decided to get the Bluetooth solution, the Arcam rBlink is definitely a good option in truth.